Dance the night away with Rio Fever. 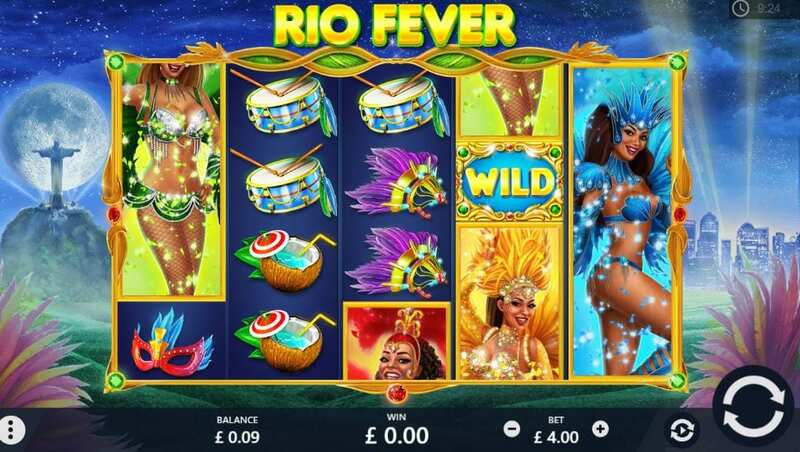 Rio Fever is a 5 reel, 40 payline slot with a carnival theme. This slot is bursting with colour and fun. You're invited to the best carnival in Rio de Janeiro where you'll hear jazzy upbeat music, dance with the bedazzled exotic dancers and soak up the glorious buzzing atmosphere. Rio Fever is filled with so much excitement. There's a random wilds feature, bonus wheel feature, wild ginga free games feature and a samba parade free games feature. Paint yourself in glitter and get ready to party! 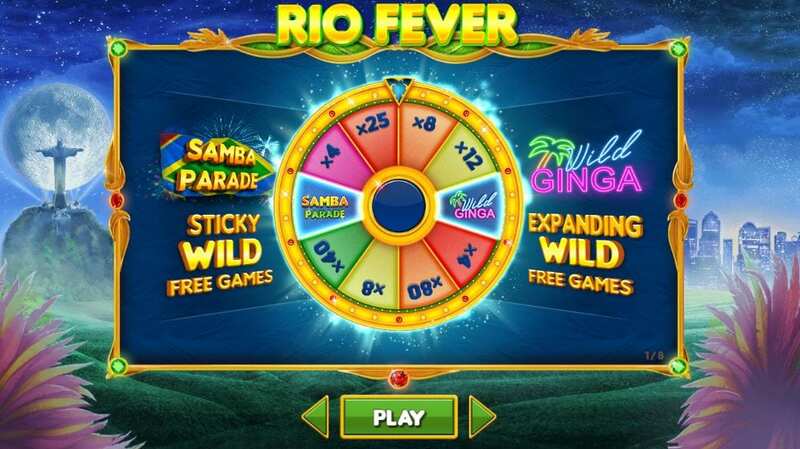 Rio Fever is an exotic slot with a carnival theme. This slot has 5 reels and 40 paylines and features very bright and colourful graphics. Behind the reels, you'll see the city of Rio de Janeiro at night with dark starry skies and skyscrapers. There's also a moon in the sky that looks like a giant sparkling disco ball which is fitting to the party theme, as well as strobes of light shining onto the city. On the reels, you'll find a variety of symbols busting with colour including a big bonus wheel, a lady in a sparkly dance costume and headdress, a headdress with pink feathers and a piña colada cocktail. Random Wilds Feature - Fireworks will spark across the screen after any spin which will add as many as 20 extra wilds to the reels. Bonus Wheel Feature - Landing 3 or more bonus symbols will activate this feature. Spin the prize wheel to determine a prize of either a multiplier between 4-80x or access to 1 of the 2 free spins rounds. Wild Ginga Free Games Feature - Once activated, you'll be given 3 free spins. With every free spin, a trumpet will sound which will blast stacked wilds onto 1 or more reels. Samba Parade Free Games Feature - There are 7 free spins up for grabs in this feature. With every free spin, 1 sticky wild will be added and will remain sticky until the end of the feature. Looking for a game filled with lots of fun? Rio Fever brings a whole new meaning to fun. The design is incredibly beautiful and bursting with colour which is fitting to the carnival theme. The backing track will have you dancing around the room, especially if you're awarded with an 80x multiplier during the bonus wheel feature!